It’s all good if your car is a mean, lean performance machine, but if it doesn’t talk the talk then you might feel like something’s missing when you’re walking the walk. We’re a bit childish here at Tarmac Sportz - we just can’t get enough of car that really goes BRUM. That’s mostly up to the exhaust system and Cobra Sport are the absolute best when you want noise. Cobra Sport’s ever-growing range of stainless steel exhausts set new standards in quality and performance. All Cobra products are made to order and generally take between 5 and 9 working days delivery. 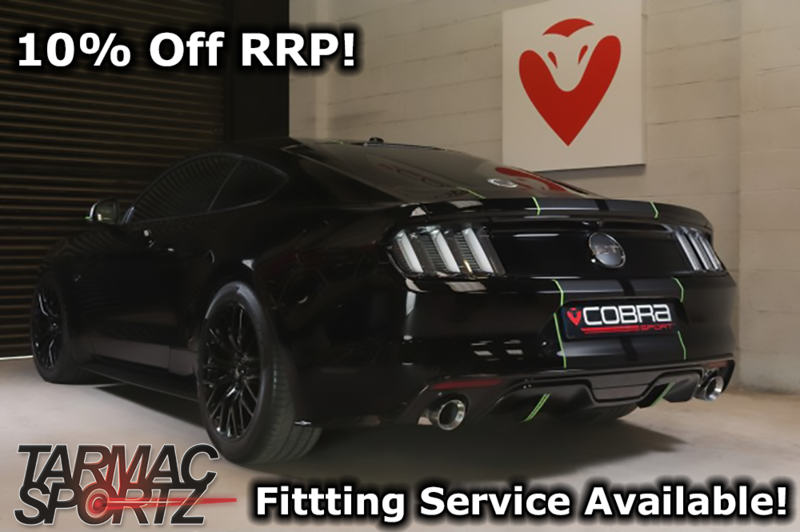 Tarmac Sportz offer 10% off Cobra's RRP - what are you waiting for? Exhausts are in the blood of Cobra Sport, a Sheffield-based company absolutely drenched in motoring and car part manufacturing heritage. The company has a history stretching back nearly half a century - company founder Philip Jarvis began making parts back in 1968, as well as racing in the special saloon championships. The company has since been passed down to the very capable of hands of his son and daughter, who we both have a great relationship with, ever since we began selling Cobra parts in 2010. We can’t help but grin when a car really makes a sound, and Cobra Sport have that same reaction to noise embedded deep in their DNA. Their exhausts come in non-resonated versions which make them so much louder, but even the resonated versions massively increase the decibels. The non-resonated versions exclude the centre silencer and give you that gutsier, sportier cacophony we all crave. They see exhausts as an entire range of instruments, and their products are specifically designed to make certain noises; crackles, pops, rumbles and roars. It’s not all bark and no bite, either. Cobra Sport exhausts let your engine breathe better, by giving the gases a shorter path to get out. This lets it all get out much faster and lets your engine spend more time combusting, giving you greater responsiveness and performance. They’ve got a track record for quality and reliability. Each exhaust system is handmade in Sheffield, by a team of expert technicians - you can really see the passion and care etched into each product of theirs. The company has been awarded the ‘Made in Sheffield’ mark - a hugely respected accolade that proves their prowess. The stainless steel sheen of their exhausts adds something a little extra to the look of your motor. They build parts for all of the big manufacturers, because they are trusted to deliver the absolute best. They even do bespoke products if you want something really special- we absolutely love their exhausts, here at Tarmac Sportz. Cobra Sport manufacture exhausts for such a wide array of vehicles, as you’d expect from a company with as much experience and staying power as them. Cars include; Audi TT, BMW 3 Series, Citroen DS3, Fiat 500, Ford Focus, Honda Civic, Lexus IS200, Mazda RX-8, Mitsubishi Evo, Nissan 350z, Renault Clio, Seat Ibiza, Subaru Impreza, Toyota Celica, Vauxhall Astra, VW Golf, and many more.